Keep scrolling all the way to the bottom of the page for WIT Reports and Blogs. The Winter Intensive Training Program is not for the casual dressage rider, but for aspiring young riders who are committed to be the best they can be. This program takes determination, drive and passion. 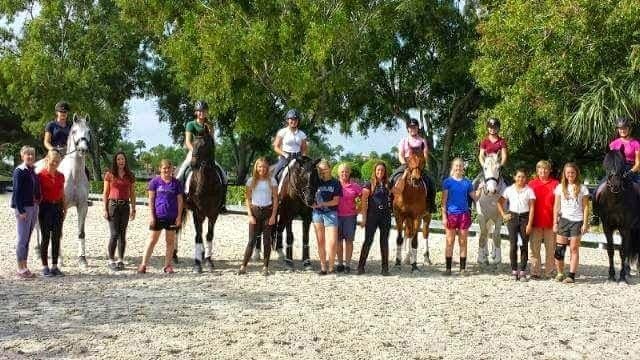 Taking place in Wellington, Florida the participants will have a full schedule of learning that includes fitness, theory, tests, riding lessons, field trips and lectures on many pertinent subjects. 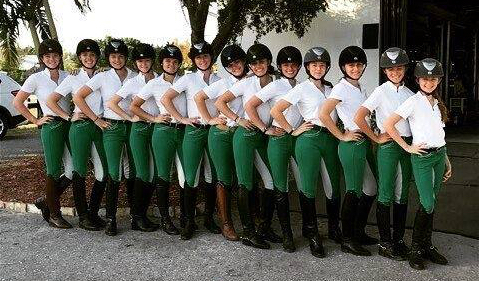 It involves three months (January-March) of pure growth and first-hand experience to open the young rider’s eyes to what it’s like to be a the best dressage rider they can be. Two time Olympian Lendon Gray is the main instructor of the program. Lendon Gray was voted into the USDF Hall of Fame and has been the long-time teacher for international riders such as Courtney King-Dye, Chris Hickey, Mica Mabragana, Meagan Davis, Jocelyn Wiese, Rachel Chowanec, Isabelle Liebler, and Gwyneth McPherson. The goal of the Winter Intensive Training Program is to give opportunities for youth riders to participate in consistent and extensive training not only in riding, but in all areas of horse care, riding and training theory, and competition skills. A normal day in the program starts at 6:30am with basic barn chores. Each rider must take care of his or her own horse as well as help with maintaining the facility where the program is held. After chores, lessons begin. Days vary with private lessons, semi-privates or group lessons. Lendon Gray is the primary instructor, but guest instructors like Tuny Page, Courtney Dye, Michael Barisone, Spanish Olympians: Dani Martin and Juan Manuel Munoz, Rachel Saavedra, Mica Mabragana, Melanie Taylor, Robert Dover, Charlotte Bredahl, Scott Hassler and others have taught in the past. While lessons are going on riders are encouraged to watch and ask questions. In the afternoon, there is typically a lecture on topics ranging from current events to sport horse handling. Participants learn from top experts in their fields of nutrition, sports psychology, learning skills, fitness, shoeing, etc. During the week, participants will also take field trips to see international riders’ farms (Tuny Page’s Stillpoint Farm, Juan Matute’s Catherine Haddad’s, Tinne Wilhelmsen’s, etc), audit clinics, tour world class facilities and experience everything Wellington has to offer. A large diversity of topics is covered. High quality lectures, hands on learning and experience are applied to mold each participant into a well educated and complete professional. There are opportunities to show at the two show grounds in the Wellington area. The Global Dressage Festival grounds are within hacking distance and there are shows there almost weekly. No one is required to show. All participants must also maintain a regular fitness program. Guest lecturers help to show riders different activities in which they may participate. Fitness might include yoga, equilates, running, swimming, weight-lifting, general aerobic training, as well as coordination exercises. Any rider under 26 may apply to take advantage of the rare opportunities this program has to offer. It does not matter how much experience you have, at what level you’re currently riding, or the horse you have. Your dedication, passion and discipline are what must shine on your application. Participants in the Winter Intensive Training Program are held to high standards of character and professionalism. Below are listed blogs from the 2013 WIT riders. These blogs will give you a good idea of what the program was like. Contact Lendon Gray at graydressage@gmail.com if you have questions. If this program interests you, please feel encouraged to apply by sending in the application now. There is no deadline. The first selections are made in the beginning of August. As space allows later applications are accepted. You will need to put a short video of you riding on the web for viewing by the committee. The program’s fee includes your stall, hay, shavings, lessons, coaching at showings and stable management supervision. The fee in 2018 is $2800 per month. It does not include horse’s vet, farrier, transport, show fees, supplements and your living or food expenses. There is time during the day for participants to continue school and/or be tutored. Housing and schooling is to be arranged by the participant. Last year as many as 7 participants shared housing and those without cars were able to get rides with those who had cars. This is to be worked out by the participants. You may attend for the full three months or a shorter amount of time only if stabling permits. Apply today for your chance to participate in this life-changing program! If you will be doing schoolwork during the program, how do you plan on completing it? Examples include online, tutoring, etc. Please explain.